The Hydrological cycle in the Mediterranean Experiment (HyMeX, https://www.hymex.org/) programme is a 10-year concerted effort at the international level started in 2010 with aims to advance the understanding of the water cycle, and with emphases on the predictability and evolution of high-impact weather events, as well as on evaluating social vulnerability to these extreme events. The special issue is jointly organized between the Atmospheric Chemistry and Physics, Hydrology and Earth System Sciences, Ocean Science, Natural Hazards and Earth System Sciences, Atmospheric Measurement Techniques, and Geoscientific Model Development journals. It aims at gathering contributions to the areas of understanding, modelling, and predicting at various timescales and spatial scales of the Mediterranean water cycle and its related extreme events, including cyclones, heavy precipitation, flash floods and impacts, drought and water resources, strong winds, and dense water formation. The special issue is not limited to studies conducted within HyMeX: any multiscale or multidisciplinary approaches related to the Mediterranean water cycle are encouraged. The potential of W-band radar reflectivity to improve the quality of analyses and forecasts of heavy precipitation events in the Mediterranean area is investigated. The 1D + 3DVar assimilation method has been adapted to assimilate the W-band reflectivity in the Météo-France kilometre-scale NWP model AROME. The results suggest that the joint assimilation of W-band reflectivity and horizontal wind profiles lead to a slight improvement of moisture analyses and rainfall precipitation forecasts. The study reports on the impact of the assimilation of wind data from airborne Doppler cloud-profiling radar in a kilometre-scale NWP model on predicting heavy precipitation events in the Mediterranean area. The positive impact of the assimilation of such data is particularly evidenced for a heavy precipitation event and results are slightly encouraging over a 45-day period. 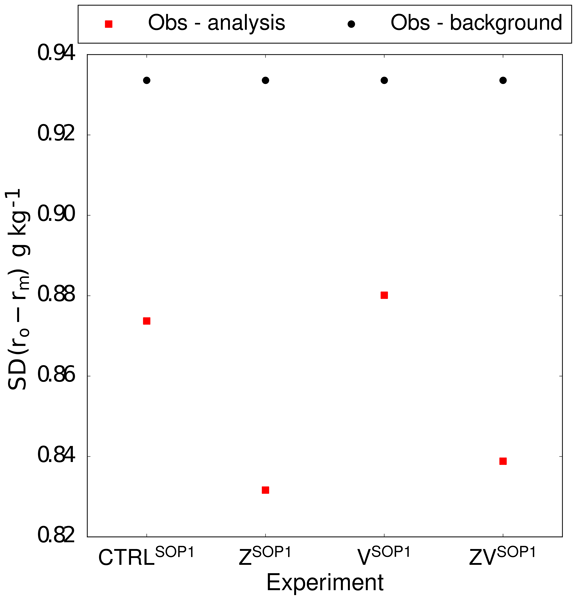 In addition, the impact of the length of the assimilation window in a 3h-3DVar assimilation system is investigated. In situ rain temperature measurements are rare. Soil moisture and soil temperature observations in southern France are used to assess the cooling effects on soils of rainfall events. The rainwater temperature is estimated using observed changes of topsoil volumetric soil moisture and soil temperature in response to the rainfall event. The obtained rain temperature estimates are generally lower than the ambient air temperatures, wet-bulb temperatures, and topsoil temperatures. 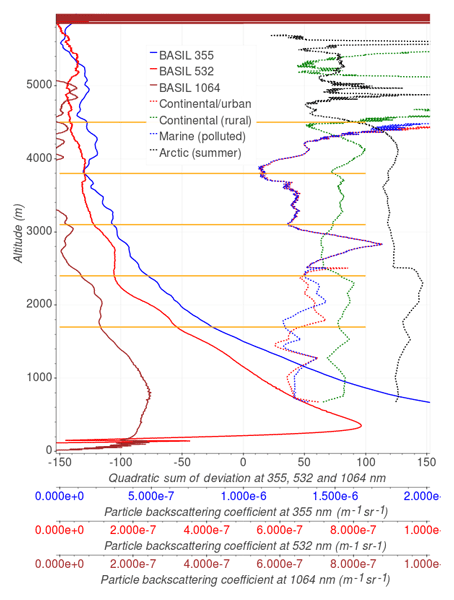 Vertical profiles of the particle backscattering coefficient at 355, 532 and 1064 nm measured by the Raman lidar system BASIL are compared with simulated particle backscatter profiles obtained through the application of a Mie scattering code and the use of simultaneous and co-located measurements by an optical particle counter on board the French research aircraft ATR42 operated by SAFIRE in the framework of the Hydrological Cycle in the Mediterranean Experiment – Special Observation Period 1. This work aims to estimate the extent to which the terrain descriptors and the spatial resolution of the hydrological model influence flash-flood modelling at the local and basin scale. The skill of the hydrological simulations is evaluated with conventional data (such as discharge measurements) and impact data (post-event surveys and high-water marks). The results reveal that the spatial resolution has the largest impact on the hydrological simulations, larger than soil texture and land cover. 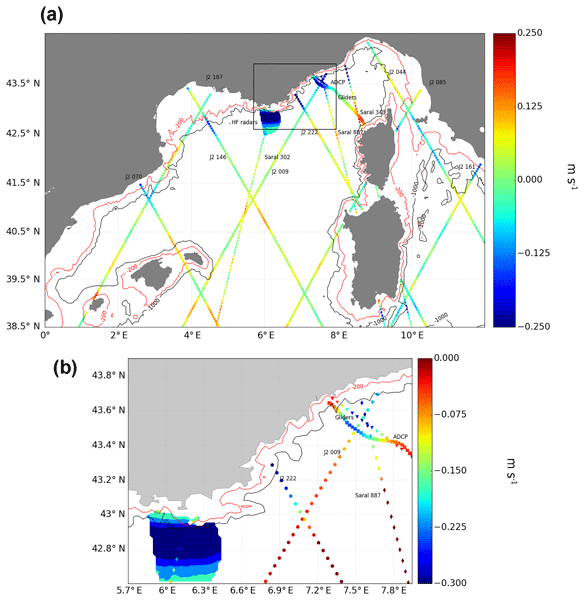 This study uses different in situ and satellite measurements to investigate ocean circulation in the NW Mediterranean Sea. We analyze how the different instruments (satellite altimetry, HF radars, gliders, ADCPs) capture current variability and how they complement each other. We demonstrate the ability of satellite altimetry to capture the fluctuations of the narrow coastal Northern Current at different timescales. This study provides an integrated approach to a coastal dynamics study. In this work a probabilistic rainfall nowcasting model, a non hydrostatic high-resolution numerical weather prediction (NWP) model corrected with data assimilation and a distributed hydrological model are used, together with radar observations to implement an hydrological nowcasting chain. This chain is used to obtain a useful discharge prediction in small catchments with time horizon of 2–8 hours. In order to define a dry period, a threshold for wet days is usually considered to account for measurement errors and evaporation. In the present study we compare the threshold of 1 mm / day, the most commonly used, to a time varying threshold describing evapotranspiration to compare how the risk of extreme dry spells is estimated with both thresholds. Results indicate that considering a fixed threshold can underestimate extreme dry spells during the extended summer. We derived an 8-day 500 m resolution surface water fraction product over the Mediterranean for 2000–2017 based on MODIS and SRTM data. Our dataset could serve as a tool for (a) monitoring the seasonal, inter-annual and long-term dynamics of surface water extent especially in arid and semi-arid areas; (b) updating and refining of existing wetland and habitat databases; and (c) evaluating ecosystem services and biodiversity assessments. 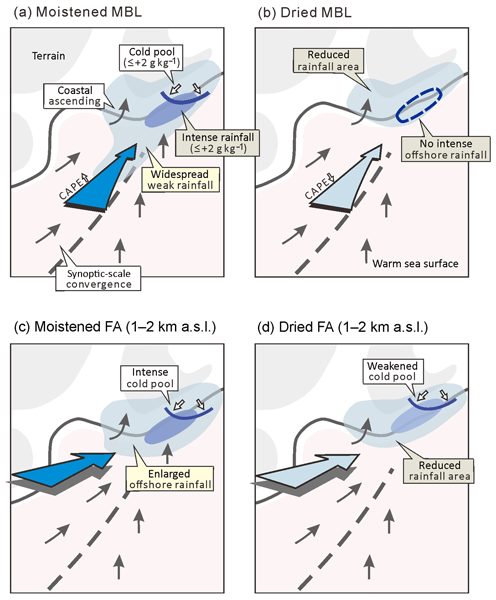 Mycrophysical effects of aerosols were found to weaken precipitation in an Euro-Mediterranean area. 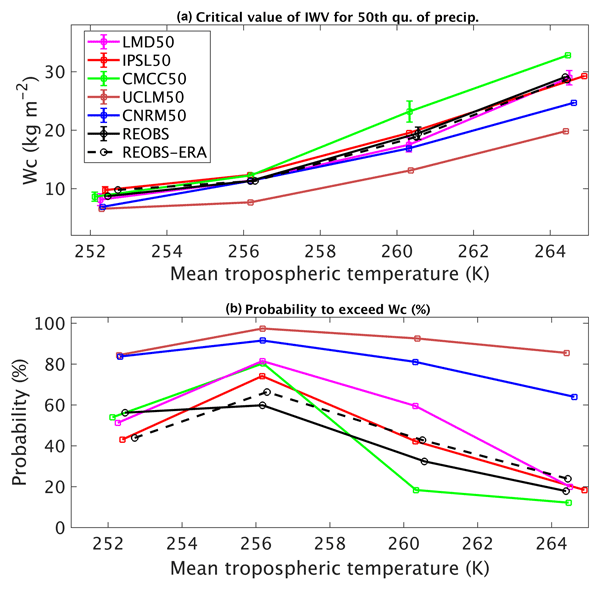 The present numerical study quantify the processes that may be involved through the use of the temperature-precipitation relationship. It shows larger aerosol effects at low temperatures. At these temperatures, the most contributing process is the increase of atmospheric stability through an enhanced aerosol cooling effect in the lower troposphere compared to the upper troposphere. This study is an effort for a better understanding and quantification of the water cycle and related processes in the Mediterranean region, by dealing with satellite products and their uncertainties. The aims of the paper are 3-fold: (1) developing methods with hydrological constraints to integrate all the datasets, (2) giving the full picture of the Mediterranean WC, and (3) building a model-independent database that can evaluate the numerous regional climate models (RCMs) for this region. The AROME-WMED (West-Mediterranean) model is a dedicated version of the mesoscale Numerical Weather Prediction AROME-France model which ran in real-time during the first special observation period of HYMEX. Two reanalyses were performed after the campaign. This paper depicts the main differences between the real-time version and the benefits brought by both HyMeX re-analyses. The second re-analysis is found to be closer to observations than the previous AROME-WMED analyses. Over semi-arid regions, it is essential to have a correct representation of the groundwater processes in climate modelling. We present a Land Surface and Groundwater Model that incorporates groundwater–soil interactions, groundwater–rivers flow and lateral transport at the subsurface. We study the groundwater influence on soil moisture distribution and memory, and on evapotranspiration in the Iberian Peninsula. Shallow water table regions persist and provide water to the surface during droughts. We investigate how rivers in a flash-flood-prone region in southern France respond to rainfall depending on initial soil moisture. Therefore, high-resolution data of rainfall, river discharge and soil moisture were used. We find that during dry initial conditions, the rivers hardly respond even for heavy rain events, but for wet initial conditions, the response remains unpredictable: for some rain events almost all rainfall is transformed to discharge, whereas this is not the case for others. This study shows the possibility to improve the weather forecast at the very short range (0–3 h) using lightning and/or radar reflectivity observations. We consider two different events occurred over Italy, named Serano and Livorno, characterized by moderate and exceptional rainfall, respectively. The improvement given to the forecast by using the lightning and/or radar reflectivity observations is considerable, the best performance being obtained when using both data. 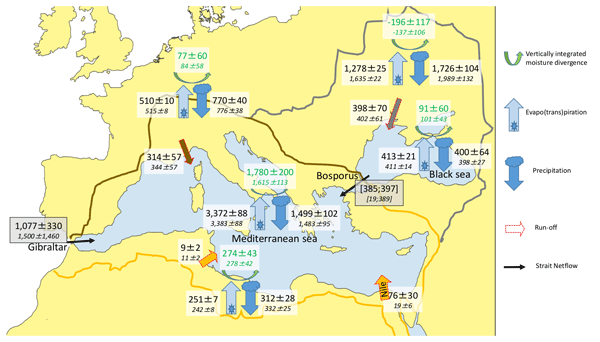 This study presents a comparison of flood properties over multiple Mediterranean and Desert catchments. While in Mediterranean areas floods are related with rainfall amount, in Deserts we observed a strong connection with the characteristics of the more intense part of storms. Because of the different mechanisms involved, despite having significantly shorter and more localized storms, Deserts are able to produce floods with magnitude comparable to Mediterranean areas. The long-term study of precipitation, flows, flood or drought mechanisms, in the Réal Collobrier research Watershed, located in South-East France, in the Mediterranean forest, improves knowledge of the water cycle and is unique tool for understanding of how catchments function. This study shows a small decrease in rainfall and a tendency marked towards a decrease in the water resources of the catchment in response to climate trends, with a consistent increase in drought severity and duration. The distributed, process-oriented model, MARINE, was used to test several hypotheses of flow dynamics in soils during flash flood events in the Mediterranean area. Results show that the most realistic hypothesis for each catchment is consistent with existing in situ observations and measurements. The study also highlights the potential of distributed modelling and spatial observations in hydrology, especially in dealing with equifinality issues. We study here the main moisture sources in the two famous Western Mediterranean flood events of autumn 1982 (October and November). Results confirm the hypothesis that a large amount of precipitable water was involved, which was to a great extent advected from the tropics and subtropics. This remote moisture transport occurred at medium levels of the atmosphere trough moisture plumes or atmospheric rivers. In the October event the contribution of local sources was also important. Vertical profiles of the atmospheric water vapor mixing ratio are retrieved with an algorithm based on the combination of measurements from a wind profiler radar and radiosoundings at a coarser time resolution. The major advance with respect to previous works is the use of the radar capacity to detect transition levels, such as the top level of the boundary layer, marked by a maximum in the radar reflectivity. We report here the first survey of stable water isotope composition over the Mediterranean sea made from aircraft. 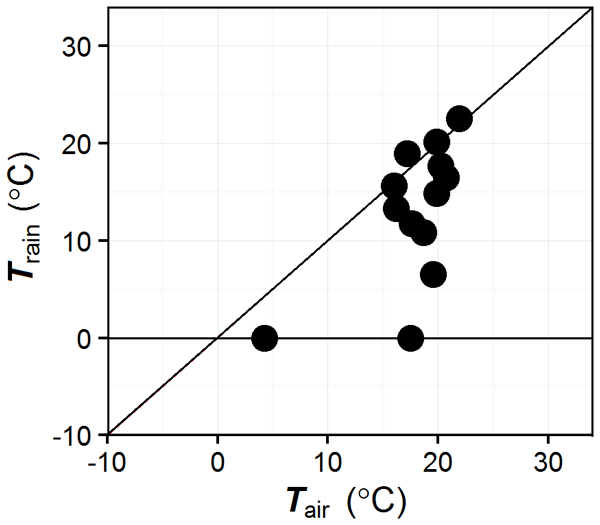 The stable isotope composition of the atmospheric water vapour changed in response to evaporation conditions at the sea surface, elevation, and airmass transport history. Our data set will be valuable for testing how water is transported in weather prediction and climate models and for understanding processes in the Mediterranean water cycle. 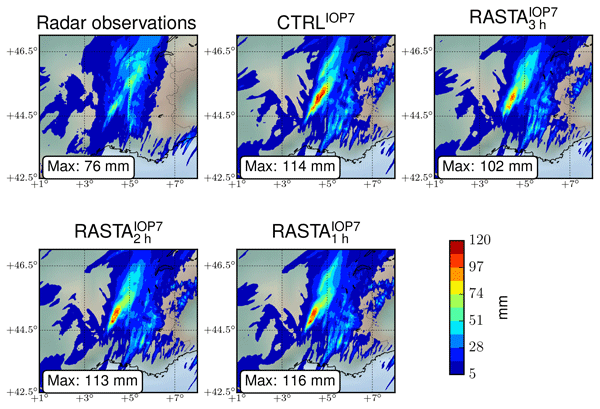 The quality of two high-resolution precipitation datasets for Spain at the daily time scale is reported: the new SAFRAN-based dataset and Spain02. ERA-Interim is also included. The precipitation products are compared with observations. SAFRAN and Spain02 have very similar scores, and they perform better than ERA-Interim. The high-resolution gridded products overestimate the number of precipitation days. Both SAFRAN and Spain02 underestimate high precipitation events. We analyze the direct radiative impact of an intense African dust plume on orographic precipitation in the Western Mediterranean in the fall of 2012 using high resolution simulations from a convection permitting mesoscale model validated against measurements acquired during the first special observation period of HyMeX. We show that the dust direct radiative effect in such a dynamical environment is not sufficient to impact 24-h accumulated rainfall in the dusty simulation. To support the instrument deployment during HyMeX, aiming at studying the high precipitation in the Mediterranean area, a dedicated version of the operational convective-scale AROME-France model was developed: the AROME-WMED model. This paper presents the main features of this numerical weather prediction system in terms of data assimilation and forecast. The forecast skill of the model is then assessed during the HyMeX special observation periods and compared to the operational AROME-France.